Limited personal space is a challenge in dorms. Living in dorms has long been part of the college experience for traditional students fresh out of high school. However, dorm life does present several disadvantages, causing many students to explore options for off-campus living in apartments or houses. The significance of dorm drawbacks varies based on a student's personality and objectives. Students don't get a lot of space and privacy in dorms. Typically, you share a room with one to three other students. Two-person dorms normally have one large room with two beds and shared living space. If students have conflicts with roommates, it is difficult to get breathing space. Additionally, dorms have lots of rooms, and students face distractions from neighbors who may be noisy or have parties. Restrooms and showers are also normally shared, further inhibiting privacy. Dorms offer very limited opportunity for customized living. They are essentially box spaces with basic full-sized beds, desks, closet space and shelves. Aside form hanging up posters, students can't do much to make a dorm room just like home. Painting and adjustments to fixtures and decor are usually prohibited. Students may be able to rearrange furniture, such as beds and desks, assuming they aren't anchored to floors or walls. Students excited about leaving home and gaining freedom may find dorm rules a bit of an annoyance. While you don't have mom and dad around to monitor your behavior, you do have residence life staff or resident adviser that communicates and enforces rules. Dorms normally have quiet hours during which students must avoid slamming doors, having loud conversations and playing loud music. Bans on alcohol and tobacco are also common in dorms. College campuses often shut down during periods when students have breaks from classes. Spring break, winter break and summer break are common periods during which dorms are closed to coincide with class breaks. Students are typically expected to leave campus and go home to stay with family. Access to cafeterias is also normally limited during this time. Students who prefer year-round living space and a full kitchen area to prepare meals might benefit from an off-campus apartment or home. 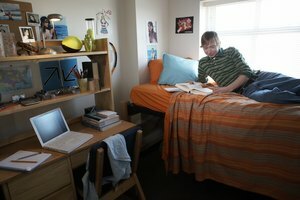 College Parents of America: Should My College Student Live Off Campus? Kokemuller, Neil. "The Disadvantages to Staying in Dorms." Synonym, https://classroom.synonym.com/disadvantages-staying-dorms-10598.html. 26 September 2017.